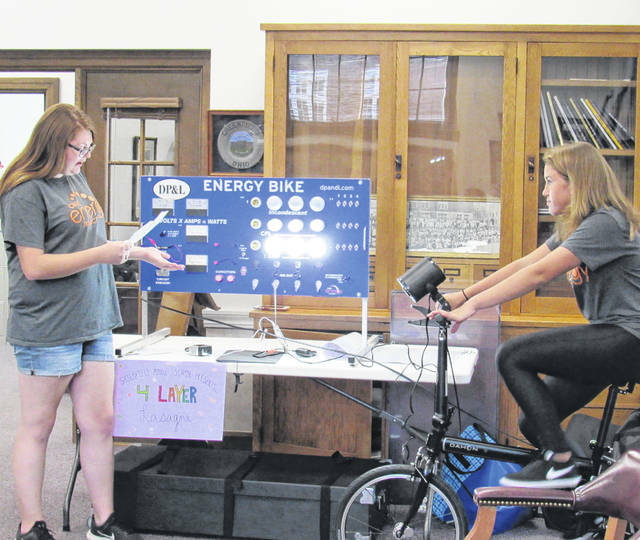 Middle school students Chloe Kirsch, left, and Shayna Beatty, seated on the bike, demonstrate to Greenfield school board members how their energy bike works, a project made possible by DP&L through a program geared toward fostering girls’ interest in science. A group of middle school students gave the Greenfield Exempted Village Schools Board of Education a lesson in energy at Monday’s school board meeting courtesy of Dayton Power and Light. According to middle school science teacher April Leaverton, as part of a DP&L program geared toward fostering girls’ interest in science, she and the four girls in June traveled to a DP&L location in Beavercreek and learned about energy, met female employees of the company who work in various capacities, and came away with the knowledge and enthusiasm to build an energy bike, using materials provided by DP&L. Students showed school board members a large board which they built. On one side, the board was covered with circuits and interconnecting wires, and on the other side neatly arranged gauges, switches and light bulbs. To demonstrate, one of the students pedaled the bike while another student explained what was happening on the energy board and in the various components being powered by the bike. The girls also demonstrated the energy generation by powering a fan and a radio, both of which they plugged into the energy board. Leaverton said the project is available districtwide with the students able to share the presentation to help others learn about energy. In other business, superintendent Joe Wills said the first days of school have gone “extremely well.” Likewise, so has a new procedure implemented for safety purposes. This year, school officials decided to close Fifth Street from Jefferson Street to Lafayette Street during school hours in order to create a safer area for kids being dropped off, picked up, and coming to and from the Imagination Kingdom, the playground across the street from the elementary and middle school buildings. In previous years, vehicles have come from both directions dropping off students, and the buses have been interspersed in the traffic tangle. Wills said the response from parents, students and drivers has been positive overall, but officials will continue to study the situation and make changes if necessary. Employment recommendations approved by board members were Carrie Lovely as secretary/aide; Theresa Kossler, cook; Matthew Bateman, aide/monitor; Janet Branson, clerical and cafeteria; Margie Trefz, aide/monitor and cafeteria; Lynn Cornwell, aide/monitor; and Baxter Wagner, eighth grade football. In a special meeting held on Aug. 9, the board’s approved employment recommendations included Lisa Ater, middle school intervention; Audrea Stark, clerical, aide/monitor, cafeteria; Leanna Warren, clerical, aide/monitor, cafeteria; Meshelle Dean, clerical, aide/monitor, cafeteria; Karen Jennings, cafeteria; William Roller, aide/monitor; Coy Tite, aide/monitor; Jeffrey Everhart, custodian; and Kyle Bennett, bus driver. Greenfield Exempted Village School District is scheduled to meet in regular session again at 7 p.m. Sept. 17 at Rainsboro Elementary. Members of the public are welcome to attend the meetings.